A Golf Bag Cart Has It's Place in Golf History . . . The history of the Golf Bag Cart is very interesting. Until the early 1960s, most golf courses were played exclusively on foot. Most golfers carried their own bags or pulled them behind with a hand cart. Golf hand carts were the only way to transport the golf clubs! Those more fortunate golfers that were able to play golf at country clubs had caddies available to carry their clubs. One of the very first known golf bag carts was a “Pull” cart, and it was designed and made by a Mr. Bruce Williamson in Portland, Oregon in 1945. His original golf pull cart was made from two lawn mower wheels with hard rubber tires mounted on a spring-suspension chassis with a fold-down mechanism which could be attached to a standard golf bag. See photo below. Mr. Williamson acquired a business partner, E. Roy Jarman, and they formed the Jarman-Williamson Company in 1946. 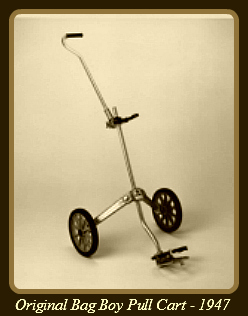 They began producing these basic golf pull carts from a combination of aluminum tubing and sand-casted metal parts. All of the parts in the design were connected with bolts so as to make it easy to replace any damaged parts, which consequently made the cart last longer and alleviate costly repairs. This really helped the Golf Bag Cart to be more "user friendly"! A metal die-casting process was introduced into the manufacturing process in 1947 to enhance the quality of the metal components. Round-shaped zero pressure tires on dish wheels were added to the folding chassis mechanism at that time. In 1957, Bruce Williamson sold his interest to Roy Jarman, but the company name was retained until 1967 when it was changed to The Jarman Company. By then, the company was marketing its own golf cart bag, the “Cart-Mate,” which was designed to attach to the pull cart by means of a few part changes. With continuous improvement in both design and methods in all products and procedures, the Jarman Company had grown to be international in scope. In 1993, AMF Industries bought the Company and relocated it to Richmond, Virginia making it a division of The Ben Hogan Company. Later on in 1997 the Hogan Company was sold to Spalding, a very well established sporting goods company. In 2002, the Company was now known as the Bag Boy Golf Cart Company. At this time, they developed the first-ever push golf cart. This new innovation cart was designed to be pushed in front of the golfer, providing a new means to walk the course in comfort and relaxation.This was a very meaningful improvement to the Golf Bag Cart development in general. The Bag Boy golf push cart quickly gained acceptance and accelerated the industry-wide transition from pull carts to push carts. Although pull carts are still available, 80% of Bag Boy carts sold today are golf push carts. See a sample of today's push cart in the photo below. Photo Courtesy of The Bag Boy Golf Cart Co. This Express 240 as shown in the above photo, has numerous great features found in the Express line of carts; The new G-Force wheels, an adjustable aluminum bag bracket and high strength anti-splay support cables. 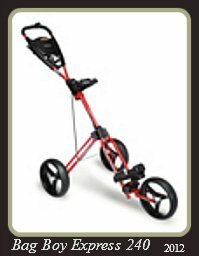 This premium Golf Bag Cart model features everything required from a push cart, including the handle-mounted parking brake and a push button folding mechanism! Over 60 years ago, Bag Boy introduced the first pull cart to the golf industry. Today, they still offer a pull cart known as the two wheel M-330. See photo below. The Bag Boy Golf Cart Company also has electric golf hand carts. 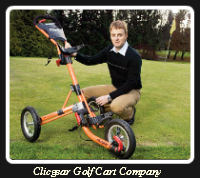 One of Bag Boy's electric golf carts shown below is their self-propelled “Navigator”. It's the only remote control golf cart featuring gyroscopic navigation technology for hands-free navigation. It climbs and descends hills effortlessly and features a rechargeable battery guaranteed to last through 18 holes of play. Photo Courtesy of Clicgear Golf Cart Co.
Clicgear is a Hong Kong-based company that designs, manufactures and distributes high quality and innovative sports products for active people. These products are provided to many markets around the world through distribution partners. All products are manufactured in their own factory with delivery directly to distribution companies, reducing cost and complications. The quality of Clicgear products is a team effort from start to finish. Clicgear products are designed by head industrial designer Kevin Kimberley (Shown in above photo). Based in Hong Kong, Kevin has been working as an industrial designer for over 16 years and has had a wide range of experience in Petroleum, Mechanical and Industrial Engineering. 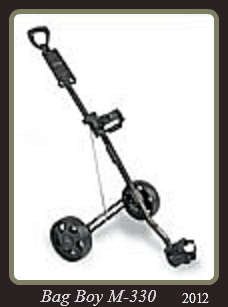 The Golf Bag Cart is one of their best products. Photo Courtesy of CaddyTek Golf Cart Co.
CaddyTek is an online retailer specializing in high quality golf equipment including; Golf Push Carts, Golf Pull Carts, Remote Control Golf Carts, and Electric Golf Carts. CaddyTek provides the E-Z-Go™ line of Golf Pull Carts, Golf Push Carts, Electric Golf Trolley and Remote Control Caddy Carts. This company will also offer a Caddytek brand golf trolley in the near future which is developed and designed with AgoGos Golf Inc. which is the exclusive E-Z-GO Golf Push carts, Golf Pull Carts, Golf Trolley & Electric Carts, and Remote Control Carts manufacturer and distributor. Photo Courtesy of Sun Mountain Golf Cart Co.
Sun Mountain products are available at over 7,000 retailers across the U.S. and Canada. 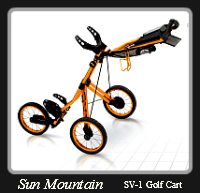 Go to the website to find the nearest Sun Mountain authorized dealer. You may also purchase some products directly from the website. Photo Courtesy of Bat-Caddy Golf Cart Co. 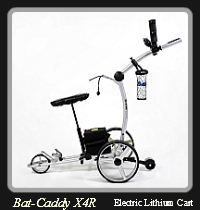 The Bat-Caddy X4R™ Lithium is one of the most innovative and unique remote controlled caddies on the market. It features an amazingly lightweight high tech aluminum frame weighing in at only 24 lbs (11kg). It has an easy two step, two click set up design folding into a very small package. This Golf Bag Cart is really cool! 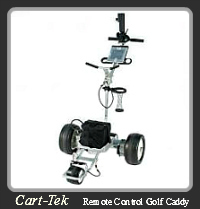 CartTek Golf Carts is a provider of the finest motorized golf caddies available to the walking golfer today. Over twenty five years of Importing experience gives CartTek the advantage in delivering the perfect products for this demanding category. Direct involvement with factories in Asia along with designers working directly with the engineers, gives CartTek the ability to respond to all of the many challenges from customers. 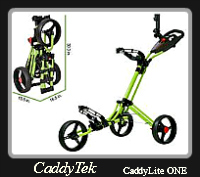 For over two years, the GRX-1200R has been CartTek's best selling Remote Control golf caddy. 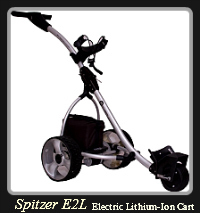 The 1200's tubular steel frame makes it the workhorse of electric motorized golf caddy's. Golf hand carts have certainly gone through a distinct evolution over the years. Today's golf hand carts, the golf pull carts, push carts, and self-propelled carts are very different from the original hand carts made for golfing. These modern golf hand carts of today take up much less space than earlier versions and they fold up quickly and in a simple fashion. They are much easier to set up as well as being lighter in weight and more compact when folded. When these hand carts are used on the golf course, they roll with ease. We hope you have enjoyed this brief historical trip through the origin of the Golf Bag Cart.